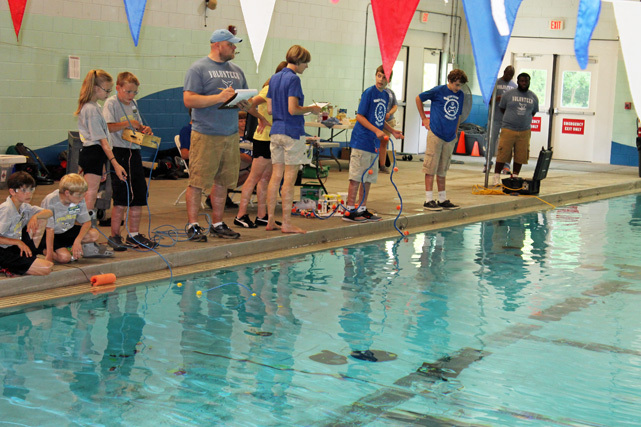 Sixteen student teams from middle, junior and high schools competed in the 2016 Gray’s Reef Southeast Regional MATE ROV Competition at the Chatham County Aquatic Center on April 30. After a full day of competition, seven-time regional champion Carrollton High School won the right to advance to the international round, held in June at the NASA Johnson Space Center Neutral Buoyancy Lab in Houston. Carrollton High School, located west of Atlanta, has fielded strong teams that have placed as high as ninth in the global competition. Its team InnovOcean holds high hopes of taking home the top prize this year and will compete against students from various locations including Canada, Russia, Hong Kong and Scotland. Beginning in 2004, Gray’s Reef National Marine Sanctuary partnered with the Marine Advanced Technology Education, or MATE, Center to offer underwater robotics as a vehicle to teach science, technology, engineering and math. The ROV competition requires students to build tethered underwater robots — called remotely operated vehicles, or ROVs — from scratch, and then challenges them to perform tasks simulating real-world operations conducted by exploration organizations like NOAA’s National Marine Sanctuaries, NASA and other marine agencies worldwide. Teams are able to choose from four different classes of competition defined by skill level, instead of age, which further illustrates real-world circumstances. Only two classes — the Explorer and Ranger levels — are eligible to compete at the international competition. In order to win, teams must not only build and successfully pilot an underwater robot, they have to create a company to market and sell their ROV. Students prepare posters, product spec sheets, safety procedures, design abstracts, business cards and presentations to working professionals who serve as contest judges. Led by Jody Patterson, events coordinator at Gray’s Reef National Marine Sanctuary, staff and sanctuary volunteers organize the regional competition and create simulated workplace scenarios for the ROV pilots. 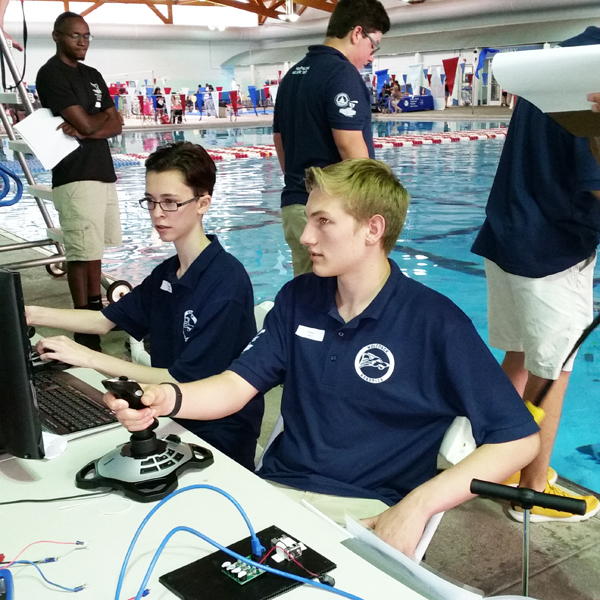 This year’s regionals focused on “innerspace” ROV tasks, including recovering equipment, conducting forensic fingerprinting of oil spills, analyzing deep water studies of corals and capping wellheads of oil rigs. The sanctuary’s Team Ocean volunteer divers worked all day with NOAA divers to continually set up the underwater task components. Other volunteers served as judges and safety inspectors. A close-up look at Georgia’s first oyster hatchery will be one of the featured attractions at Skidaway Marine Science Day on Saturday, Oct. 24. The campus-wide open house will be held from noon to 4 p.m. on the University of Georgia’s Skidaway Island campus, located on the north end of the island. The oyster research team will provide behind-the-scenes tours of the new hatchery, which is a project of the UGA Marine Extension’s Shellfish Laboratory and Georgia Sea Grant, units of UGA Public Service and Outreach. It is hoped the oyster hatchery will make the Georgia oyster industry more durable, contribute to aquaculture diversification and elevate one of Georgia’s best-kept culinary secrets from the backyard roast to the tables of the finest restaurants from Savannah to Atlanta and beyond. The hatchery tour is just one feature of a lengthy program of activities, displays and tours making the annual event one that attracts thousands of visitors each year. The UGA Skidaway Institute of Oceanography’s 92-foot ocean-going Research Vessel Savannah will be open for tours and will exhibit science displays. 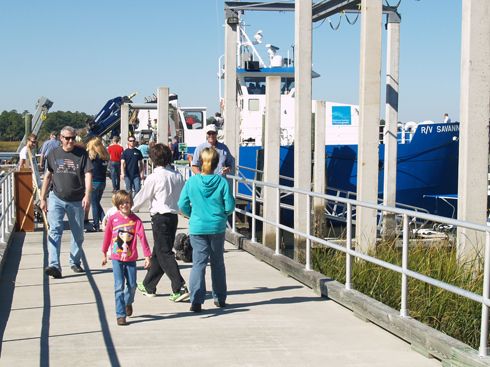 Tour the Skidaway Institute’s ocean-going Research Vessel Savannah. Elsewhere on campus, Skidaway Institute will present a variety of marine science exhibits and hands-on science activities, including the ever-popular Microbe Hunt and Plankton Sink-Off. Skidaway Institute scientists will present a series of short, informal talks and question-and-answer sessions on current scientific and environmental issues. The UGA Aquarium, operated by UGA Marine Extension, will be open to visitors with no admission fee. Aquarium educators will offer visitors an afternoon full of activities including a hands-on reptile exhibit, behind-the-scenes peeks of the aquarium, fish feedings and microscope investigations. 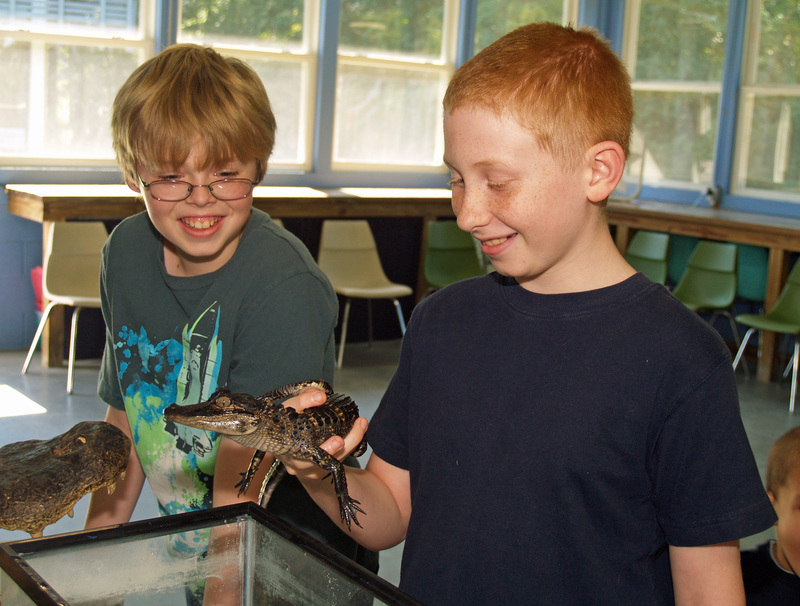 The Reptile Experience fascinates nature lovers of all ages. A brand new touch tank exhibit will allow guests of all ages to get up close and personal with common coastal invertebrates. 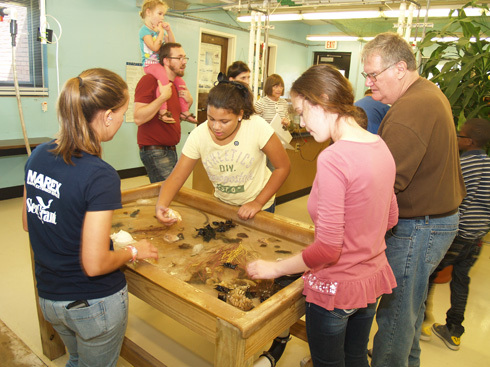 Touch tanks allow visitors to experience sea creatures up close. Gray’s Reef National Marine Sanctuary will offer visitors the experience of using the tools of the trade. They can explore an underwater reef with a remotely operated vehicle and find out how youth can participate in Savannah’s own MATE ROV competition. ROVs are underwater robots used on NOAA research vessels worldwide and are crucial for data collection in marine environments. “Fly” an underwater ROV with Gray’s Reef. A photo booth will allow visitors to visualize themselves SCUBA diving at Gray’s Reef or in other exotic settingsand will be able to post their pictures on social media. Along with the campus organizations, Skidaway Marine Science Day will also include displays, demonstrations and activities from a wide range of science, environmental and education groups, such as The Dolphin Project, the Georgia Sea Turtle Center and The Nature Conservancy. Georgia Power will be on hand to provide information on the upcoming wind turbine project planned for the Skidaway Institute campus. 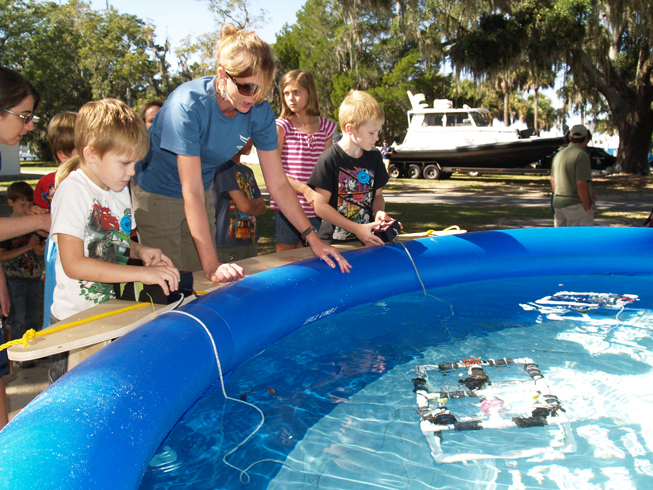 All activities at Skidaway Marine Science Day are free. For additional information, call 912-598-2325, or see http://www.skio.uga.edu.